"This is surely the first systematic survey of architectural journals produced across Europe in that vital 20-year period following the war when modernism was in vexed transit from embattled cause to contested orthodoxy. Scholarly country-by-country coverage reveals how the medium of the professional journal functioned as both a mirror and a torch, reflecting while also guiding the inextricable narratives of practice and discourse. Journalism may be but ‘the first rough draft of history’, yet this fascinating study shows what a rich and compelling draft it can be." "During the years between 1945 and 1968 professional journals were testing grounds for institutional debates where modernist discourse has been produced and disseminated. Grounded in extensive new research, the essays in this volume by eleven international architectural scholars propose a stimulating interpretation of a medium whose role has been hitherto underestimated. 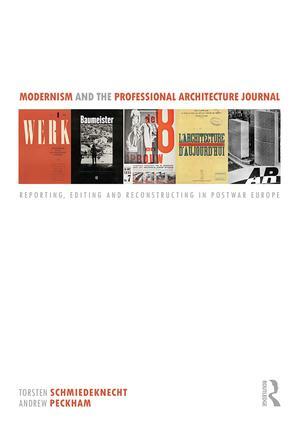 Examining the interferences between journals, design practice and the tasks of reconstruction, the book shows us how professional architecture journals, their owners, editors, contributors and designers shaped architectural culture in the postwar decades."